According to the American Forest and Paper Association, “The average American uses more than 748 pounds of paper per year.” That is an insane amount of paper! Between shopping lists, notes, appointments, paper for the kids to draw on, etc. I know that we sure go through quite a bit ourselves. It never occurred to me to turn to EXPO products to help cut back on our paper waste. 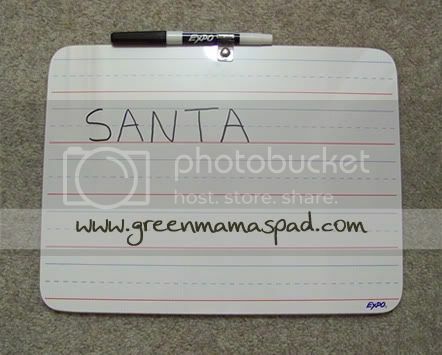 EXPO offers a wide selection of dry erase boards and dry erase markers. Their products can be used at work, school and even at home. I was sent the EXPO Learning Board and EXPO Low Odor Marker Starter Kit to try out. The EXPO Learning Board is 9' X 12' which makes it easy to use on your lap or while sitting at a desk. It is double sided: one side is blank and the other side has penmanship lines. I love the lined side for working on writing letters with my almost 5 year old. He will be entering Kindergarten next Fall and I really need to work on letters with him more. Instead f wasting a ton of paper, now we can just use this board over and over again. And it is fun for him because he LOVES using markers. The blank side is good for free drawing. Like I said he loves markers, so he can sit with this for quite a while drawing different things and then just wiping them away. The Learning Board does come with one marker, but you need some more colors to have some more fun! I suggest going with some of the EXPO Low Odor markers. In the Starter Set not only will you get 4 markers (Black, Blue, Green, Red) but you also get an eraser and a bottle of board cleaner. Now what does low odor mean? You know how there are some markers out there that when you take the top off the smell is so strong it gives you a headache? Well that is not the case with the EXPO Low Odor markers. Now don't go and stick these directly under your nose (like I just did) because they do have a smell. The difference that I noticed is that when I was using these to write on my board, there was virtually no odor. So yes if you get up close with them you will notice their odor, but in normal use you should only notice minimal odor. These markers are also AP certfied as non-toxic, as well as the cleaner. Aren't I a great artist? :) Here you can see the blank side of the board with my snazzy drawings and the starter set. The eraser is great to have to easily wipe away writing when needed. Much better then grabbing a paper towel every time. I wasn't really sure why I needed the cleaner until I started using the board. If you have ever used a white board before, you may have noticed that even after erasing something, you can kind of still see it on the board.This cleaner takes care of that. 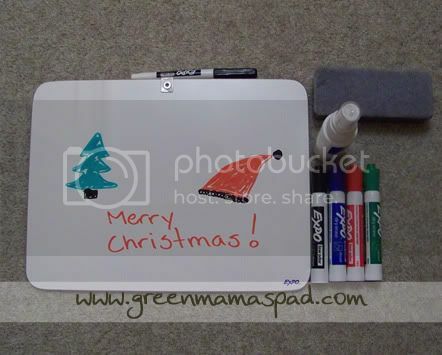 First you erase the board like normal and if needed, spray on the cleaner and wipe it away with a cloth. Any "ghosting" or "shadowing" that may have been there before will now be gone. In need of last minute holiday gift ideas? The EXPO Learning Board would make a great gift for not only the young student in your life, but your kids teachers as well. And since we all know how easily pens, markers, etc. 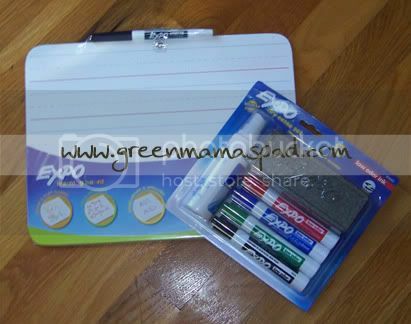 vanish into thin air, every teacher could always use a new set of EXPO markers for his or her white board at school. EXPO products can be found at a variety of stores including office supply stores like Staples and OfficeMax. Please note that the opinions and views expressed in this review are my own and based on my personal experience with the product. You may encounter a different experience with this than I did. EXPO provided me with items for review.